Xkey Air is an ultra-lightweight controller designed for mobile use. It is ideal for use with tablets and other mobile devices. Constructed from rugged, brushed aluminum, it is not only an aesthetic match for MacBooks, it is rugged and roadworthy. It only weighs 610g (1.34 lbs) so you you’ll hardly even know it’s there. Pop it in your backpack, or use the optional Xkey carry case. Connect it to your favorite device, launch your favorite app and your recording studio is open for business. Xkey Air comforms to common professional standards and protocols. 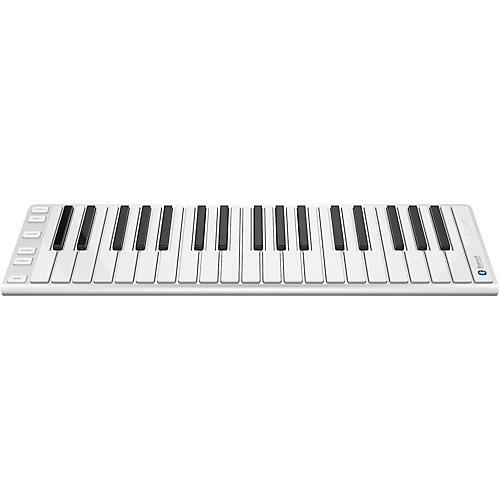 But even if you’re still learning to play the keyboard, you’ll love the quality and features. This Bluetooth 4 MIDI controller features low latency, long battery life, full-size k, and aluminum body and robust, high quality construction. Download the free Xkey Plus application and configure your keyboard how you like it. It is completely customizable to your workflow preferences. It is mobile native so all of your favorite music apps work right out-of-the-box on your favorite devices. It is compatible with hundreds of free and pro apps. The KKey is not only velocity sensitive, it also features polyphonic aftertouch, that is, your pressure on the keys controls the aftertouch effect individually, a professional studio advanced feature. Made for travelers and mobile users, it fits in just about any bag or case you might be taking along anyway. Imagine a plane flight spent writing music instead of watching a movie you wouldn’t otherwise watch. You KKey can be updated and upgraded online as features get added.